Price hike for cigarettes – That is one budget prediction you can always make, even without knowing the details about the ruling party or the finance minister. This budget is not an exception. Finance minister, P.Chidambaram has increased the excise duty of non-filter cigarettes by 16%. Brokerages are expecting an overall drop in volumes this year, for cigarette manufacturers like ITC and Godfrey Phillips India due to the excise duty hike. Now this would be music to the ears of Union Health minister Anbumani Ramadoss who is fighting hard against smoking cigarettes. Actually cigarettes prices should be increased more to 25 rs per cigratte. Thereby use this money to remove our fical deficit in next 5 years. If it is difficult to raise in one go. It can be doubled each year and reach alevel of 250/ per pack. I dont think there will be any issue from any section of people to increage cigrattes price if import price of cigrattes is also increased. This will be a win-win situation if the smokers continue to smoke we can wipe of entire deficit or if smokers quit it is more than welcome as we will have a smoke free country. 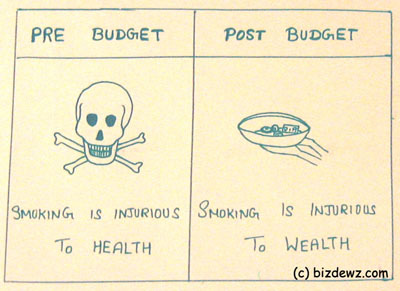 Actually non-smokers are subsidising smokers if we look at the impact smokers make in form of polution level they make, heat that is being released, Cancer related diseases they cause and government expenditure on treating such diseases and research involved in those areas. Why should a non-smoker be tax money be used to do all these activities. Instead it can be dumped on the heads of the smokers itself.